Lakes are an important component of the urban hydrological cycle, they act as source of water, run-off controller and play a significant role in enhancing groundwater recharge, regulating micro-climatic conditions and increased overall resilience of the area. These water bodies also host a wide variety of flora and fauna and provide recreation spaces. However, managing lakes amidst unplanned urban growth is a big challenge that we are facing today. Ministry of Environment and Forests (MoEF) has formulated the National Lake Conservation Plan (NLCP) and developed guidelines in 2008. In the 12th five year plan, one of the main strategic attention is towards the restoration of 0.1 million ha. of wetlands/inland lakes and water bodies by 2017. Ministry of Urban Development has also taken steps for prevention of pollution, conservation and restoration of lakes in urban areas. In 2013, the Central Public Health and Environmental Engineering Organization (CPHEEO), the technical wing of the Ministry, has come up with an advisoryon conservation and restoration of water bodies. Also, there are NGOs and research institutes which are dedicatedly working on lake conservation but still the effort is inadequate given the scale of work required for lake management across the country. The School of Water and Waste, AAETI, Centre for Science and Environment (CSE) organized a four days training on “Urban Wetlands Management” in September, 2018. The training focused on providing basic concepts and principles of urban wetland management with emphasis on their role, catchment area management and lake management processes. Participants expressed a lot of interest in the subject and were keen to work further in this direction in their own locality. Realising the fact that context matters and the challenges and solutions would be unique for each lake’s management, this trainingis a step further focusing on providing hands-on practice based sessions forthose who are directly involved in lake management. Participants areencouraged to come up with their own case examples to showcase/discuss respective cases. 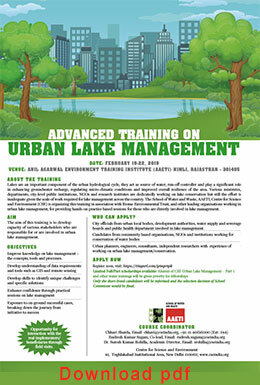 This training is being organised in association with Biome Environmental Trust and other leading organisations working in urbanlake management. The participants will also get an opportunity to interact with eminent experts from Centre for Inland Waters in South Asia, INTACH and Wetlands International. The four days short term residential training will be organized at CSE’s newly built state-of-art facility, AAETI at Nimli, Rajasthan. AAETI is a learning, training and innovation centre designed to find appropriate and affordable solutions to some of the most pressing environmental problems. To read more please click here. The aim of this training is to develop capacity of various stakeholders who are responsible for or are involved in lake management. Improved knowledge on lake management – the concepts, tools and processes. The trainings style is considerably based on the ‘Harvard Case Method’, which conveys teaching messages through interactive practical work done by trainees. The trainings will be focused on experiential learning – including individual/group interaction, practical group exercises, interaction with experts, discussions, field visit and documentary films to highlight the best management practices successfully implemented. Furthermore, the trainings are complimented by sessions and discussions on existing case studies which demonstrate the recommended actions and interventions for sustainable water and sanitation management. The training programmewill have dedicated field visits that will create opportunity for interaction with the real implementers/ beneficiaries. It will also provide a knowledge exchange platform to participants for discussing practical experiences of the best management practices for Urban Lake Management. Participants who would be selected for the training programme would either get full or part scholarship. The selection would be based on participants’ eligibility, credentials, supporting documents and probability of transforming the learnings from training into implementation “becoming a change-agent". Female participants, candidates from Economically Weaker Sections, Government institutions and sanitation alliance partners are specially encouraged to apply and avail the scholarship benefits. Full scholarship includes travel, boarding & lodging costs and training kit & fees costs. Accommodation on double sharing basis and group pick-up & drop for local travel from pre-defined locations. Part Fellowship doesn't include to & fro Delhi travel (from your respective location) costs. However, it covers all other costs mentioned above. Note: Only shortlisted candidates will be informed. Urban planners, engineers, consultants, independent researchers with experience of working on lake management/conservation. (School of Water and Waste, Anil Agarwal Environment Training Institute – AAETI). The format of the programme was extremely energizing. I would like to suggest to imply the programme on water supply systems especially for hill towns, where we are facing water scarcity issues. CSE is a think tank and provides comprehensive knowledge on issues of current importance. Looking forward for support and help in implementation of the wetland management from CSE. Interaction with fellow colleagues during the training helps to gain new knowledge which will help in playing important role in wetland management. Overall the training was excellent and looking forward for more such trainings in coming years. The training approach (group exercise, role play, socrative student app etc) is excellent. It was really heart-warming to be here in institute and getting and sharing of knowledge from all across the country was remarkable. It was a fresh and new avenue for me. I learned a lot from here. Thank to CSE and all the organizing team to make it a success.